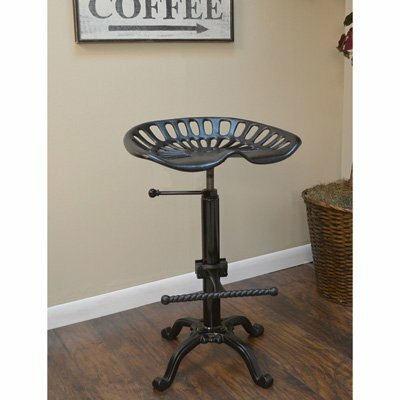 This farmhouse tractor stool delivers a comfortable, swiveling seat for easy motion. For use at a bar, in a shop, kitchen, shed or garden or on a patio or lawn, this cool stool may well become the most popular in the household. In powder-coated iron and steel, this easy-maintenance, height-adjustable seat is specifically designed to be used indoors and out. With a scrolled footrest and claw-foot base, this handsome seat adds a fun touch of farmyard chic wherever you place it. 18 1/4in. X 13 1/2in. x 25in.-35in.H. 18 1/4in. X 13 1/2in. x 25in.-35in.H. If you have any questions about this product by Carolina Forge, contact us by completing and submitting the form below. If you are looking for a specif part number, please include it with your message.